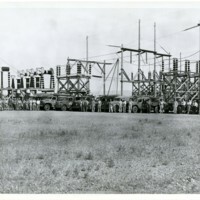 Several men lined up against cars and power station posing. 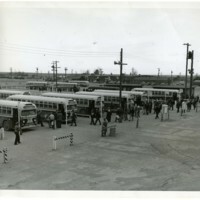 Text on back of image reads: ""Charles R. Brewer""." 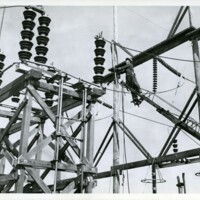 Man working at power station. 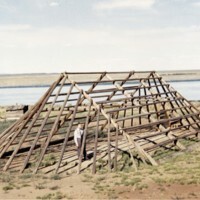 Text on back of image reads: ""Charles R. Brewer""." 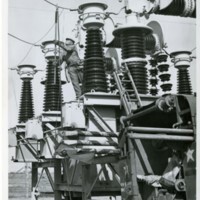 Man working on power equipment. 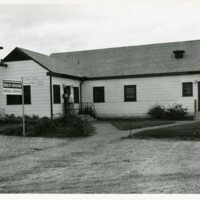 Text on back of image reads: ""Charles R. Brewer""." 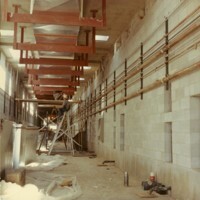 "1 photograph; 25 x 25.3 cm. 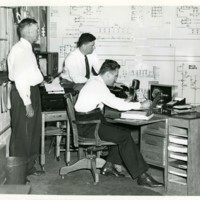 Three men in work attire, one sitting at desk using pencil." "1 photograph; 18 x 22.8 cm. 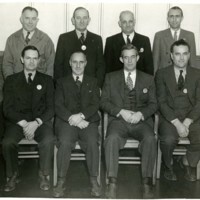 Eight men posing, 4 standing and 4 sitting. 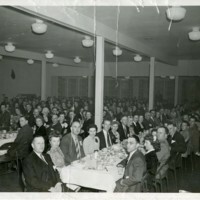 Names left to right (starting in the back row): Ed Pollard, Malley, McKeeuer, ""MHM"", (and the seated row): voyle, charly weekky, workinyer, ""Hi""." 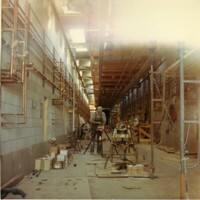 "1 photograph; 25.3 x 10.2 cm. 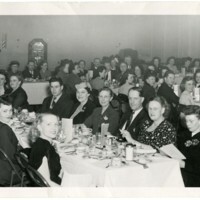 Many people, men and women, seated and dining, most looking in camera direction. 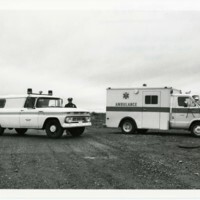 Text on back of image reads: ""Robley L Johnson Studio 911 Geo. Washington Way Richland, Washington""." 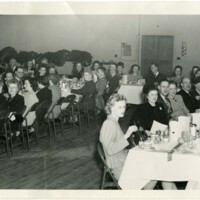 Many people, men and women, seated and dining, some looking in camera direction." 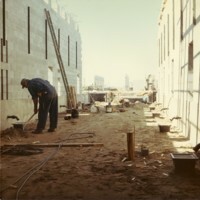 "1 photograph; 25.3 x 25.4 cm. 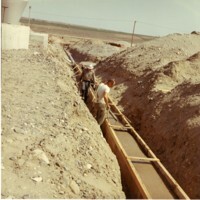 Men and pipe in ditch with concrete over pipe." 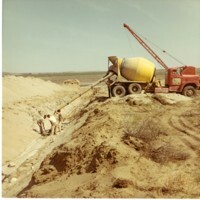 Men pouring concrete down into ditch area." "1 photograph; 25.3 x 25.5 cm. 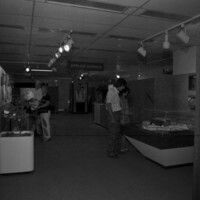 Men in ditch and outside of ditch ." 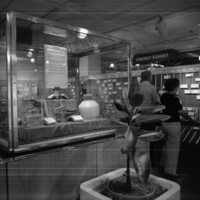 "1 photograph; 25.3 x 25.6 cm. 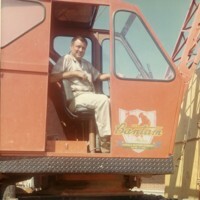 Man posing in a machine by the name of The Bantam." 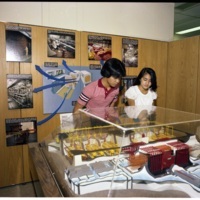 Several people in room with lots of ventilation materials." 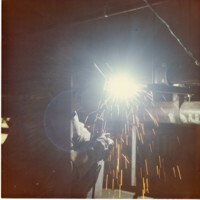 "1 photograph; 25.2 x 25.2 cm. 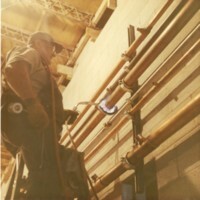 Man on ladder working with pipe." 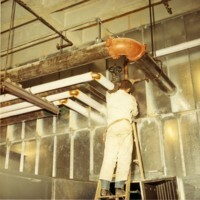 man standing on elevated platform using a hammer." 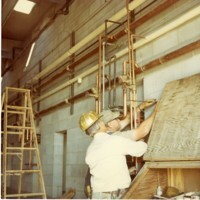 Men working on wall trying to make something level." 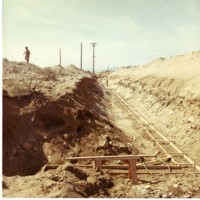 "1 photograph; 25.3 x 25.3 cm. 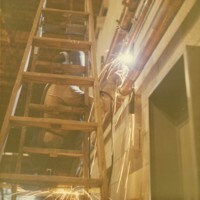 Man welding pipes on ladder." 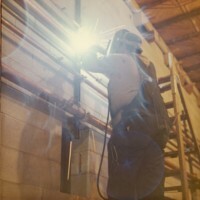 Man welding pipe on the side of a wall." 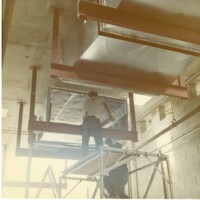 Two men working in the inside of a building." 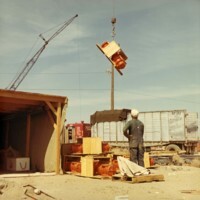 "1 photograph; 25.2 x 25.4 cm. 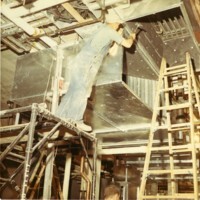 A man standing on a platform working, another man is under him also." 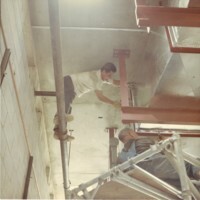 Man standing on a pipe trying to reach across space and work on something." 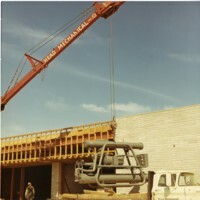 A machine is lifting another large machine from the bed of a truck." 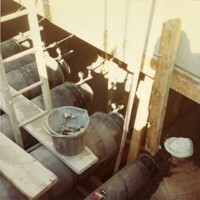 "1 photograph; 25.2 x 25.6 cm. 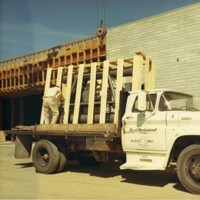 Man on truck bed with a large metal machine." 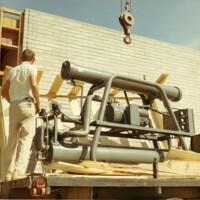 Man standing next to a large machine." 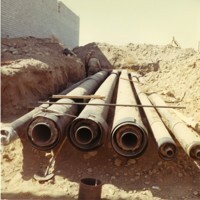 Man looking at pipes that run to a building." 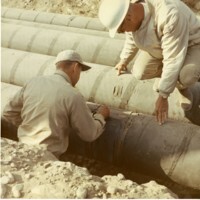 Two men looking at pipe and one man working on it." 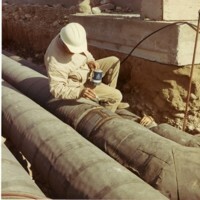 Man up close painting pipe with substance." 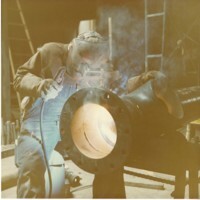 Two men painting pipe with substance with other men in background." 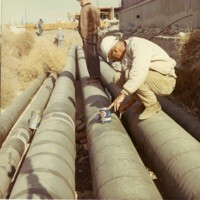 Man up close painting pipe with substance with other men in background." 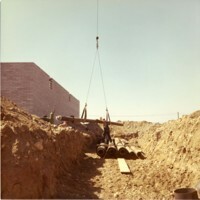 Pipes being moved by machinery, people out working." 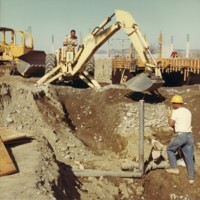 Pipes being moved by machine and directed by person." 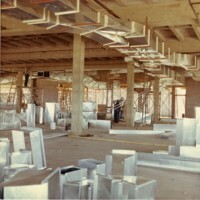 Several people in sight doing different construction tasks." 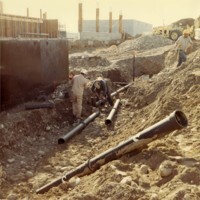 Large pipes in a dub out area with two men inspecting a pipe." 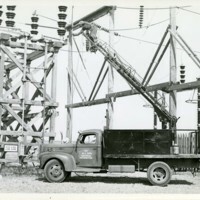 Two men, one operating machinery, the other in a large ditch area." 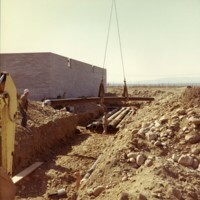 Man watching object being moved by large machine." 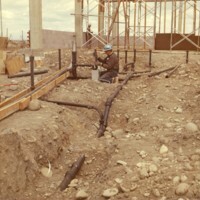 Construction going on, man working on pipes along with more construction in the background." 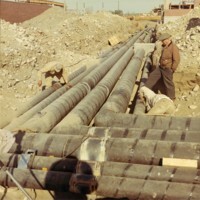 People working on pipes and other tasks in background."